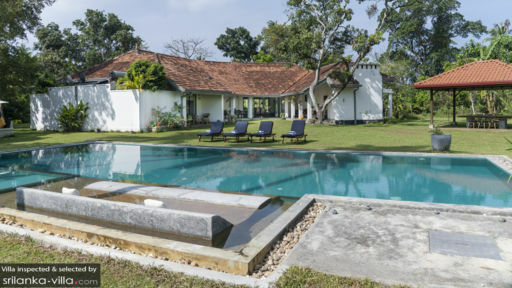 Villa Ronnaduwa is located in the town of Ambalangoda, famous for its ‘devil’ masks and devil dances, just few kilometres away from the popular tourist destination of Sri Lanka, Hikkaduwa. The guest house has four air-conditioned bedrooms, which have private verandas. Expansive lawns and tropical gardens with ample greenery border the sparkling, large swimming pool. Walled gardens afford privacy and exclusivity to the guests at Villa Ronnaduwa. Ideal for a holiday with family and friends, the villa is well-suited for those traveling in large groups! There are four uniquely-designed, air-conditioned bedroom suites at Villa Ronnaduwa. All four rooms are furnished with double beds or single beds. There are private verandas with armchairs outside each of the bedrooms. There are large and open-air en-suite bathrooms for all the rooms, which have tropical shower areas amidst plants and climbers for a complete, tropical experience. All the rooms have flat-screen TVs for your entertainment, and since the rooms are directly connected to the gardens, you can enjoy the view endlessly straight from the comforts of your bed. The villa prides itself in offering its guests a relaxing and rejuvenating holiday, where they can enjoy the stupor of their surroundings as well as the natural setting of the villa. The quiet and tranquil atmosphere is sure to perk up your mood, and ease all your worries. The expansive lawns are well-manicured and well-kept, so you can walk on the grass, do some yoga, or even have a picnic with your loved ones. A glistening, blue swimming pool resides in the middle of tropical gardens, for the perfect place to cool-off and have a fun time outdoors. Sun loungers beside the pool are the best spot to soak up the sun, and even work on your tan! 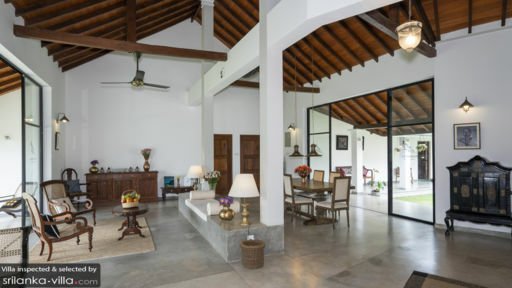 Villa Ronnaduwa offers its guest the chance to enjoy the serenity of Sri Lanka to the maximum, with outdoor sitting including several chairs and rattan sofas placed on the front porch. The open-plan living area ensures that you get the best of both outdoor and indoor living. As you step inside the living area, an almost vintage and royal scene awaits you, with traditional décor and muted tones outlining the space. The living area is comfortably furnished with armchairs and a large, royal, daybed in the middle of the room. There is ample classical lighting in the room. Just off the sitting area is the dining area with a large, wooden, dining table fit for 6-8 people. A shared kitchen is also available at the villa, fully-equipped and fitted with all modern appliances for the comforts of the guests. The staff at Villa Ronnaduwa comes highly recommended, and they will cater to all your need and necessities. They can prepare a lavish breakfast for an early, amazing start to your day of excursions and exploration. The villa offers free parking on the property and free WIFI around the property. You can request for bike/car rental as well, if desired. The villa also offers BBQ service outdoors. 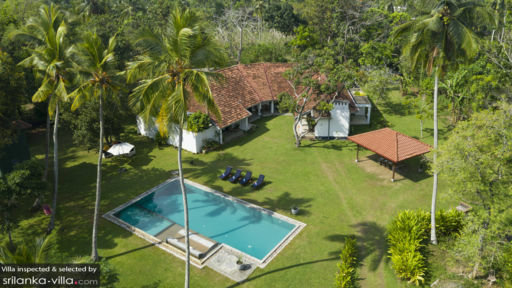 Only 7km away from Hikkaduwa, Villa Ronnaduwa is ideally located close to the beach so you can head down and enjoy a day at the beach whenever you wish. Other places of interest include Telwatta Bird Sanctuary and the Hikkaduwa Coral Reef. After a hard day of roaming around, eat out excellent restaurants like Spaghetti & Co. and Refresh! Amazing stay! The room with open bathroom was very comfortable, food was super tasty and you can spend your free time in swimming pool or with two lovely dogs in the garden. Moreover, in Villa Ronnaduwa is the most willing and helpful manager we have ever met. He recommended and arranged great trips for us, as well as answered all questions. I don’t know where to begin. We had 3 nights here and honestly it was the most perfect start to our Sri Lankan holiday. My partner and I decided on Villa Ronnaduwa due to the price and the fact it looked like bliss but our expectations were massively exceeded when we arrived. At first we felt like we were in the middle of nowhere and had no direction on what on earth to do but then we met Gihan and genuinely had the best few days ever. Firstly - the room. We had a double room and it was the best most comfortable room ever. Maybe too much so as my boyfriend slept 14 hours one night!!!! The ‘outside’ bathroom is like we never imagined and it is a real experience showering in a forest!!!! Just so you know the bathroom is connected to the room and completely private but they have a portion of the ceiling open for trees to grow up and out of, making it light and airy in there always We also had a nice large patio area. The communal areas - The set up was lovely so it felt authentic, open yet private on each side. We were a lot of the time the only guests there so we felt like we had the villa to ourselves mostly. With only 4 rooms I am sure it feels like this most of the time. The pool was AMAZING. Clean but didn’t stink of chlorine which I hate. You felt like you were in a jungle having a swim. The only noises around is the peacock (amazing I saw it once but it was incredible!!) & the birds. Truly bliss. The doggies are so cute but no bother if you don’t like dogs they don’t hassle you. I personally loved them but my boyfriend isn’t a massive fan of dogs. The food was delicious and home cooked. All authentic and fresh. We really got to try the delicacies of the country in a comfortable setting. I am picky so I worry about food but felt really looked after here. The portions are huge - don’t expect to finish your breakfast!!!!!! Finally and maybe the best part of this stay was Gihan and his guiding us through many of the areas nearby. This was an amazing place to stay at in our trip to Sri Lanka. The pool and garden is stunning, the owners are amazingly helpful and we couldn’t have asked for a better stay. The dinner we had (rice and vegetarian curry) was the best I’ve had in the whole trip! And great value for money too! We had all the help we needed, ate good food, relaxed and played with two beautiful dogs! Perfect place to spend some time by the pool to hang out and relax! The rooms were comfortable, spacious and the outdoor shower was incredible! Thank you! Amazing villa with phantastic architecture. Old Sri Lankan villa modernized with great attention to details, The owner's (grand) parents would have been be proud of what has become of their house. We had the whole villa with 4 bedrooms (two on each side of the villa, so the villa can be divide in 2 units witch each 2 bedrooms) with each an outdoor shower. Garden and large pool awesome, flocks of parrots flying by, feels like being in a park! Definitely the best location we had in sri lanka. Unfortunately we had only planned for one day here, if we had known it would be this good, we would have stayed longer.